We celebrate Independence Day, remembering the freedom we fought for centuries ago. Many patriots had to pay for this freedom with their lives and we are grateful to those who fought for our liberty. In this new novel, you get a glimpse of what another country had to fight for, as well. The freedom of speech, the freedom of equality, and the freedom to worship as we please! No one could have a greater gift than this. This tale will entertain those who enjoy bits of adventure, humor, mystery, and a tender love story. The stories of Robin Hood have enchanted readers for years. In our youth, we enjoyed hearing the escapades of Robin Hood and were spellbound by each story and how he cared for the people. How awesome would it be to live during that time period just because of Robin Hood! 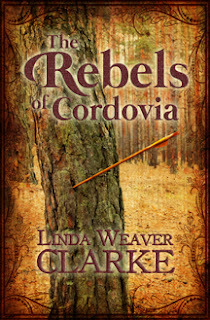 In The Rebels of Cordovia, a similar story is created but centuries after the legend of Robin Hood. But this time, there are two major groups of rebels fighting for the rights of the people. Daniel, a good-looking rogue, would be the leader of the Freemen. Robin Marie, a young woman, would be the leader of Robin’s Rebels. Each leader is an expert archer and swordsman. With bits of adventure and delectable kisses, this tale will entertain anyone who enjoys a sweet romance. In The Rebels of Cordovia by Linda Weaver Clarke, the time period is set in the late 1700s. Centuries after the legendary Robin Hood, a group of men and women find themselves fighting for the same cause: for their rights, for freedom of speech, and equality. Robin’s Rebels realize they must fight against the tyranny of a wicked king and help the people survive this oppression. In the small country of Cordovia, groups of rebels begin springing up, but its Robin’s Rebels who get the attention of the king. In this battle for freedom, a tender love story begins to blossom. Daniel, a rogue and a leader of the Freemen, doesn’t realize that the sweet feminine woman he has met and is falling for happens to be the leader of Robin’s Rebels. Realizing the importance of uniting all the rebel groups, Daniel tries to recruit Robin’s Rebels but they refuse. Now he has to find a way to convince them. When he finds out the leader is actually a woman, what will his reaction be? I am not much of a TV buff, but the one series I did watch the entire series of was Robin Hood! I love any books and tv shows that are set in the time of Robin and the 1700's. When I heard Linda was starting a new book I was thrilled. I have loved her contemporary series and was thrilled that she was writing now about one of my favorite times in history! Robin Marie is a strong character, determined to help those in need, and has a strong background in archery and wisdom to back her up. Her father, a baker, has always taken the time to help mold his youngest for a purpose such as this. Being a girl however, she must hide her identity and act with humility and the need for help... something that is very difficult for her! She reminds me of a spitfire red head for sure! Yet her heart is bigger than most as she takes food and clothing to the poor of the county. Being so independent she really has never given thought to marrying or having a beau for that matter. Her mission is of much too much importance to succumb to the whiles of a man! She is taken aback quite immediately by Daniel and his charms though. Who wouldn't be, he is a great leader among his men, handsome, and full of heart. A knight in shining armor so to speak, yet with a Robin Hood flare. As with Linda's other novels, she loves to take us a surprise adventure to keep us guessing! There is so idea of where the novel is going, but she always captures our attention with more than we thought about! Great scene development, I could visualize the people in the streets. I could see the poor running up to Robin, excited to see her, their clothes thread bare and their feet without shoes. The visual accuracy is a great asset in a historical novel like this!